The ABCD Diaries: My Favorite Gluten-Free Cake EVER from Inspired by Happiness! My Favorite Gluten-Free Cake EVER from Inspired by Happiness! Baked goods and desserts from Inspired by HappinessTM are made with premium ingredients for delicious flavors, amazing textures and moistness that you won’t believe is gluten-free. All Inspired by Happiness products are made with premium, high-quality ingredients, with all natural flavors and no artificial colors. Plus they contain no artificial trans fat. This outstanding cake was designed for dedicated chocolate lovers in mind. 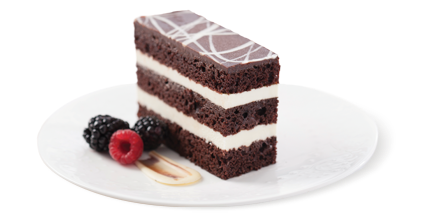 With two generous layers of the finest Belgian white chocolate mousse between layers of dark chocolate sponge cake, this chocolate ganache-topped decadent cake is moist and rich in taste - you won’t believe it’s gluten-free! 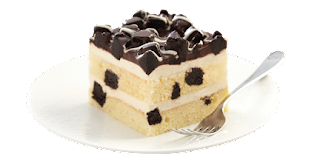 Reminiscent of an old-time favorite, this creation delights with melt-in-your-mouth sponge cake, cubes of cookies and silky vanilla cream mousse. Smothered with a dark chocolate ganache and white chocolate drizzle, this cake is so good - you won’t believe it’s gluten-free! This spectacular-looking layered cake begins with perfect succulent strawberries transformed into our most excellent strawberry fruit filling. 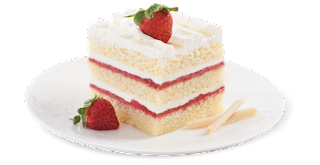 Between three scrumptious layers of light and moist shortcake, we added strawberries and the finest Belgian white chocolate mousse before topping it with real whipped cream. Finished with white chocolatey drizzle, be prepared to taste perfection - you won’t believe it’s gluten-free!